The latest news in the Garmin-Cervélo who’s coming who’s going saga was Castelli, who signed on as Garmin-Cervélo’s clothing sponsor over incumbent Pearl Izumi. The Garmin/Pearl Izumi relationship made some noise over the last couple of years, with all sorts of technological advances, including the kinda-sorta ridiculous flying squirrel suits they used in 2010. What other sponsors should we expect to see change? The title sponsor fight is long since over and done. Garmin and Cervélo are the title sponsors, and Transitions will transmogrify to being optics sponsor. And since Cervélo is in, obviously Felt is out as frame supplier. Both Garmin and Cervélo Test Team shared a number of sponsors – 3T, Fizik and Vittoria for bar/stem, saddles and tires, respectively. Some of those may change, but it won’t be due to the merger. Zipp was a CTT sponsor. 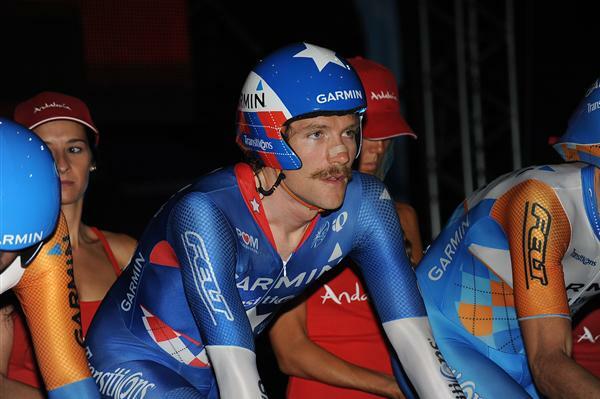 Zipp also sponsored Garmin through 2009, until they moved to Mavic in a 2 year deal. Its probably safe to assume they’ll continue on Mavic. Component-wise, we’re left with Shimano for Garmin, and SRAM with CTT – along with a cast of other manufacturers to fill in the holes, like Speedplay pedals, and Rotor cranks. If Garmin-Cervélo goes Shimano, look for Speedplay and Rotor to be out. My guess? With so many teams shifting to SRAM in the last few years, Shimano won’t want to lose another, especially with the opportunity to sponsor the World Champ. Beyond that, there are a slew of lesser sponsors. For trainers, I’d expect to see LeMond over Cycleops – cause Greg is awesome. Giro or Catlike. Bont versus letting riders pick their own shoes? I’m not sure anyone besides the company on the outs will care. With POM being charged with deceptive advertising practices by the FTC, there’s a good chance we could see them step aside, and focus on paying lawyers instead of cycling teams. Most importantly, DZNuts will probably stay on – in spite of a full array sponsors*, Cervélo missed the opportunity to brand their riders perineums. * some might have said “a fist full of sponsors”, or “a grab bag of sponsors”, but I wouldn’t want to taint my article with such sophmoric humor. This entry was posted in Featured, Teams. Bookmark the permalink. Hello Whit, I think I talked about this on my blog a wall back. A bit like yourself some speculation, some insider gossip and taps n noses. Cranks will remain with Rotor. 3T, Fi'zi:k will remain. All the riders like their kit. Why try to fixsomething that clearly isn't broken. Helmets, I'm guessing that Garmin will stay with Giro. Shoes, well I think Vaughters will keep it as is, so the riders will wear what suits/pays them the best. I hope you are right on the SRAM angle. Everytime I see the evil empire from Japan lose another team I cheer! Yep. I think we got a side-channel confirmation of that when Pearl Izumi (a Shimano-owned company) decided to sue Slipstream. Not the act of a friendly/happy sponsor.